Her Royal Highness The Princess Royal officially opened the new Wellcome/Engineering and Physical Sciences Research Council (EPSRC) funded Centre for Medical Engineering on 14 December 2017. The state-of-the-art Centre brings together world leading scientists from across King’s College London’s School of Biomedical Engineering & Imaging Sciences, and the Department of Neuroimaging, to create a centre of medical engineering excellence at St Thomas’ Hospital. Patients visiting the new facility will benefit from a concentration of expertise that will improve the understanding, diagnosis and treatment of neuropsychiatric, oncological and cardiovascular diseases. The National Institute for Health Research Biomedical Research Centre at Guy’s and St Thomas’ NHS Foundation Trust and King’s College London is a public engagement partner for the centre and supported the application for the grant. One aim of the Centre is to engage various public audiences about our research which means that there is dedicated funding for events and public engagement. 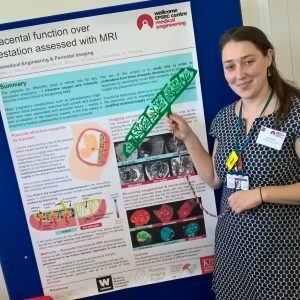 It was fantastic being able to meet so many researchers and to learn about the exciting work taking place within the new Centre for Medical Engineering. I learned from Jana Hutter about how MRIs can help us to understand more about the structure of the placenta throughout pregnancy and how this can improve health during pregnancy and the long term health of pregnant women. 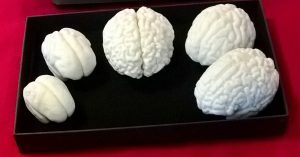 Tom Arichi introduced me to some 3D models of the tiny brains of premature babies and explained how the brain develops as they continue to grow outside of the womb. I also spoke to Peter Carlton about his team’s work to develop a wearable device for hospital inpatients which monitors their breathing rate and can predict early signs of a heart attack. I look forward to working with team in the future to share their fantastic work with our patients and the public.